By Paul Emrath, Ph.D., and Joshua Miller, Ph.D.
Energy consumption has been a focus of federal, state, and local policymakers. Often, residential construction in particular is targeted, through building codes, weatherization programs, etc. This article analyzes the role of the housing sector in total energy used in the U.S., and the characteristics of the home and the occupants that impact energy consumption. The residential sector accounts for 22 percent of energy consumption in the U.S., if energy used to generate and transmit electricity is included. Combined, all single-family and multifamily housing built in the previous 10 years accounts for 3.2 percent of energy consumption (again, including electricity losses). On a per square foot basis, the newer the home is the less energy it uses. Newer homes are larger, but over the long run the effects of increased efficiency more than offset the extra square footage. Homes built since 1999 tend to use the same to slightly less energy than homes built before 1950. Electricity used for something other than space heating and cooling (HVAC) accounts for over 70 percent of energy use, irrespective of when a home was built. The non-HVAC electricity is only modestly influenced by factors under a builder’s control. If analyzed properly, square footage has a very small impact on non-HVAC use. Under realistic assumptions, the energy-use impact of items purchased by the occupants after a home is built can be twice as large as the impact of items typically installed by a builder. If household size and appliance use are above average but still in a realistic range, the energy-use impact can easily be four times as large as the impact of the builder-installed items. The following sections explain the data and analysis used to generate these and other findings. The U.S. Energy Information Administration (EIA), the statistical agency of the Department of Energy (DOE), estimates the energy consumed by various sectors of the economy. Many EIA estimates are based on its surveys of energy users. For the housing sector, the end-use survey is known as the Residential Energy Consumption Survey (RECS), and is conducted every four years. The latest RECS data comes from the 2009 survey, the results of which were released to the public in 2013. In addition to the RECS, EIA published periodic updates to the “Emissions of Greenhouse Gases in the United States” report. The latest report, covering data through 2009, was released in 2011 and is the last of its kind EIA intends to produce. 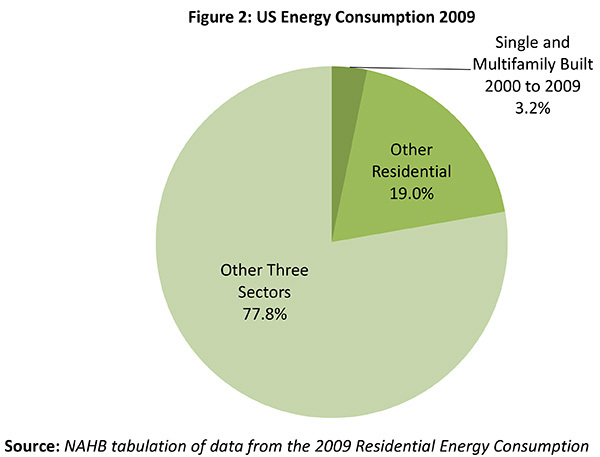 The EIA report for 2009 shows that the residential sector accounted for 22 percent of all energy consumption in the U.S. (Figure 1). The figure does not include a separate electric power sector, even though energy is certainly used in the process of generating and transmitting electricity. This is because EIA allocates the energy used to generate and transmit electricity to the sector that ends up using it. The current EIA estimate is that for every 1 BTU (British thermal unit) of electricity used in a home 2.1 BTUs are lost in generation and transmission, and these “lost” BTUs are included in the 22 percent. 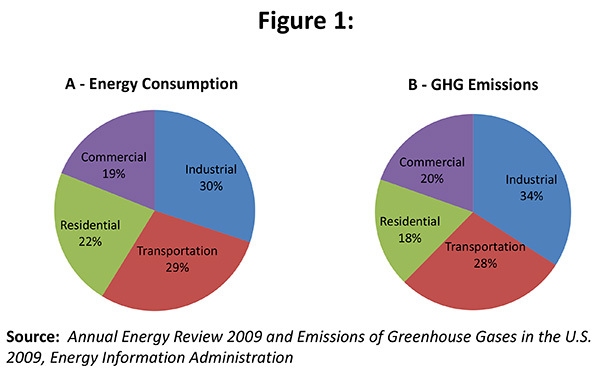 Sometimes, policies intended to reduce energy use are driven by concern about greenhouse gases. In the residential sector, CO2 associated with energy consumption accounts for nearly all greenhouse gas emissions. In other sectors, especially manufacturing, appreciable amounts of other greenhouse gases are emitted; so that, while the residential sector accounts for 22 percent of energy consumption, it accounts for a somewhat lower 18 percent of greenhouse gas emissions. If greenhouse gases are the concern, the energy lost in generation and transmission and the method used to generate the electricity are critical parts of the equation. For example, if electricity is used to heat the home, and hydroelectric or nuclear power is used to generate the electricity, this is close to a zero-greenhouse gas system. But if fossil fuels are burned to generate the electricity, using electricity rather than gas would more than triple the emissions. The RECS data can be used to break residential consumption into more detail, including showing the consumption of homes by year built. The result is shown in Figure 2. Recently built (during the past 10 years) single-family and multifamily homes together accounted for only 3.2 percent of U.S. energy consumption. The share is small when compared to other residential consumption and the other three sectors. Table 1 (all tables are available in the “Additional Resources” box at the top of the web page) shows underlying detail for Figure 2. The “other residential” category includes single-family and multifamily structures, and all manufactured housing. Manufactured housing is built entirely in a factory and transported to the final site where it is attached to a foundation. Its construction is governed by HUD regulations rather than local building codes. Table 2 contains additional detail on energy use in single-family detached homes—separating average energy consumption into three categories; electricity consumed at the residence, electricity lost in generation and transmission, and fuels other than electricity. The table also shows how much energy is used for HVAC (the common industry acronym for heating, ventilating, and air conditioning) within each category. From the table it is clear that each component of energy use varies depending on when the homes were built. Average energy consumption tends to increase overall as the homes get newer, but this is largely a function of electric heating being more common in newer homes—and especially more use of electricity for non-HVAC purposes (both multiplied by a factor of 3.1 to account for BTUs lost in generation and transmission). Compared to homes built before 1950, average consumption of energy other than electricity is 46 percent lower in new homes (built after 2000). Total energy used for HVAC irrespective of the fuel is 1.7 percent lower. Irrespective of the vintage of the home, over 70 percent of the electricity consumed is used for something other than heating or cooling the home. It has been well documented that the size of new homes has generally increased over time. The U.S. Census Bureau shows the median size of new single-family homes completed rising from under 1,700 square feet before 1987 to over 2,100 after 2000. But new homes have also become more energy efficient, as builders have applied technologies that reduce the consumption of energy. These technologies include better insulation, energy efficient appliances, and better HVAC equipment. 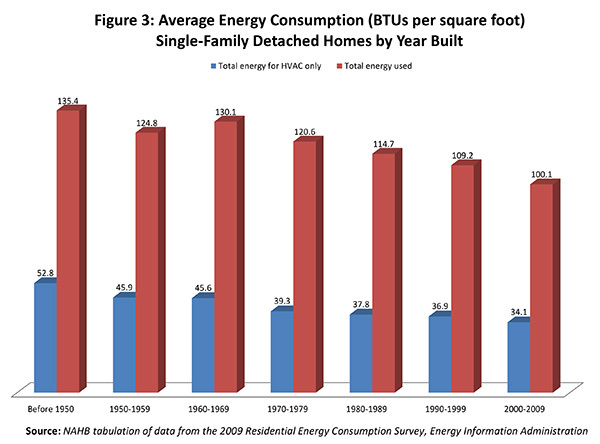 Figure 3 shows average energy consumption per square foot steadily declining by year built. Single- family detached homes built before 1950 on average used 135.4 BTUs per square foot whereas recently built single- family detached homes (built after 1999) on average used 100.1 BTUs per square foot. Table 3 under “Additional Resources” contains more detail. Energy used specifically for HVAC shows a similar but even more consistent trend, declining steadily from 52.8 thousand BTU for homes built before 1950 to 34.1 for homes built after 1999. Figure 3 also helps illustrate how much energy is used for purposes other than HVAC. Because non-HVAC uses of electricity account for such a large share of residential energy consumption, and because over two BTUs are lost in generation and transmission for every one used in the residence, it’s important to know what drives consumption. To study this, NAHB applied a statistical model to the 2009 RECS data (appending some information on area income and home values from the Census Bureau’s American Community Survey). The model finds that the price of electricity, physical characteristics of the home, characteristics of household members, electricity using devices that sometimes may be installed by the builder but are often purchased later by household members, as well as details of how households use the devices all play a role in determining how much electricity is used in a home. The details are in a technical appendix (available under “Additional Resources”). 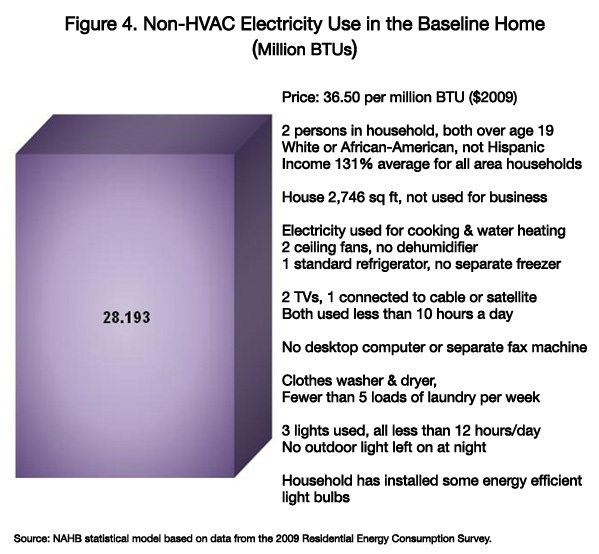 To illustrate the relative strength of these various factors, Figure 4 begins with the model’s estimate of just over 28 million BTUs used annually by a baseline single-family detached electric home (i.e., one that uses electricity for cooking and water heating). Use of electricity for cooking and water heating is often governed by availability of piped natural gas. When natural gas service is available, builders answering a special question on the survey for the August 2012 NAHB/Wells Fargo Housing Market Index (HMI) said they installed at least one gas appliance in 88 percent of these homes. The assumptions used to define the baseline home are listed in the figure. The list of items in the baseline includes most used in the final statistical model, although a few of the more unusual items are omitted. The items that are included are set to average or otherwise typical values. Figure 5 shows the impact of changing the size of the home and various items that are usually installed by the builder. The general criterion for choosing these items is installation by builders at a rate of more than 5 for every 10 single-family detached homes built in the 2012 according to Builder Practices Survey conducted by Home Innovation Research Labs. Ceiling fans were not covered in this survey, but the RECS data show that they are generally common in single-family detached homes, and they require some specialty construction skills to install. Of course, even when an item is installed by a builder, the builder may not have total control over the selection process. Choice of a particular product may be heavily influenced by local availability, code requirements, and customer preferences. In the October 2012 HMI survey, builders said their customers were responsible for the choices of appliances 37 percent of the time and lighting 36 percent of the time. 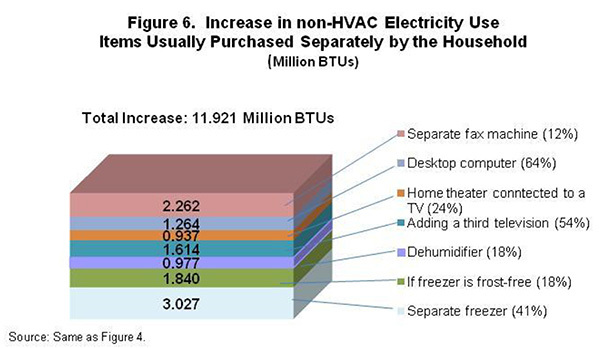 The cumulative impact of altering the builder-installed items as shown in Figure 5 is about 5.5 million BTUs added onto the 28.1 million BTU baseline. The largest individual effects by far is the installation of an extra large (50 gallon plus) water heater. Although building codes mandate hot water, and details of how the heater must be installed, they don’t say anything about the water heater capacity. As discussed in the appendix, NAHB’s statistical analysis pays particular attention to modeling the effects of square footage, something often blamed for energy use. After statistically controlling for household size, income and other factors, the remaining pure effect of house size on non-HVAC electricity use appears quite small as shown in Figure 5. This outcome is present even when of the size of the home is doubled. 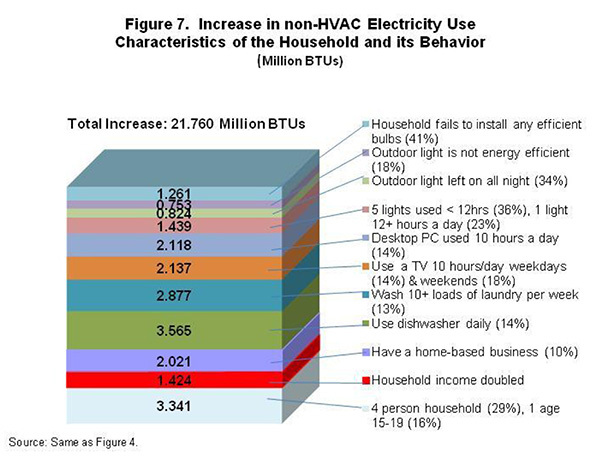 Figure 6 shows the impact on electricity consumption from items usually not installed by builders such as televisions and computers. The values were chosen to be above the typical baseline, but still within a range that occurs fairly often in practice. The threshold is generally a change that captures at least 10 percent of single- family detached homes, usually considerably more. The incidence of each item is shown in the figure: 41 percent of homes have at least one separate freezer, 18 percent have a dehumidifier, 54 percent have at least three television sets, etc. In total, these items add 11.9 million BTUs onto the 28.2 million baseline. The separate freezer in particular uses a considerable amount of electricity. If the household buys and uses a separate freezer, and if the freezer is frost-free, it alone accounts for nearly 5 million additional BTUs. Although energy consumption from items purchased can be larger than energy consumed from builder installed items under realistic assumptions, the impact of household characteristics and behavior can easily be even larger (Figure 7). To keep the example in a realistic range, a minimum cutoff of present in at least 10 percent of the homes is again used. An aggressive assumption of doubling household income is included, primarily to illustrate the pure effect of income, if not combined with a larger household or one of the listed behavioral changes, is relatively modest. The change in household size can have a particularly strong effect, if it includes someone between the ages of 15 and 19. Among the various aspects of household behavior, the behaviors with the greatest impact on electricity consumption are using a dishwasher daily and washing at least 10 loads of laundry per week. Although above average, this rate of dish and clothes washing is not that uncommon, present in 14 and 13 percent of the homes, respectively. In comparison, the impact of altering home design and items usually installed by builders is 5.5 million BTUs a year, or a little under 20 percent added on to the baseline from Figure 4. Under above average but still realistic assumptions, the impact of items usually not provided by a builder can be twice as large (42 percent added to the baseline) and the impact of household attributes and behavior that the builder obviously can’t control can be 4 times as large (a 77 percent increase). According to recently released information from the EIA, the residential sector accounts for 22 percent of energy consumption in the U.S.—provided the energy lost in the process of generating and transmitting electricity to the residential sector is included. This 22 percent is not the effect of building homes, but the cumulative effect of energy consumed by the occupants in the existing homes. Combined, all single-family and multifamily housing built in the previous ten years accounts for 3.2 percent of energy consumption (again, assuming the electricity loss are included). On a per square foot basis, the newer the home is, the less energy it uses. Newer homes also tend to be larger, but over the long run the effects of increased efficiency tend to outweigh the extra square footage; so that, in total, homes built since 1999 tend to use the same to slightly less energy than homes built before 1950. However, except for some unusual cases like electrically-heated swimming pools, non-HVAC electricity use (which accounts for more than 70 percent of total residential energy consumption) is only modestly related to factors a builder might be able to control. If we begin with a baseline home that uses electricity for cooking and water heating (something very often governed by local availability of natural gas), and double the size of the home and add or increase the capacity of electricity using items that a builder usually installs, it adds about 5.5 million BTUs per year onto the 28.2 million baseline. In comparison, the effect of adding items that are present in a substantial share of homes but seldom installed by builders can easily be twice as large. And, if household size and appliance use are above average but still within a realistic range, the energy-use impact can easily be four times as large as the impact of the builder-installed items. A small amount of sulfur hexafluoride, a greenhouse gas commonly used to insulate high voltage electrical equipment, may escape during transmission and distribution of electricity to the residence. Although five home features are omitted because they are relatively uncommon: well water pump, electrically heated hot tub, large heated aquarium, auto engine heater, electrically heated swimming pool. Except for well water pump, these items are present in fewer than 10 percent of all homes. Well water pumps are present in a little over than 10 percent, but their relevance is confined almost exclusively to the subset of homes located where there is no public water supply. Each of these less common items has a substantial effect on electricity consumption, but the effect of an electrically heated swimming pool is by far the largest of any variable included in the model. Electrically heated pools are also particularly uncommon, being present in less than 1 percent of the homes. If the freezer was over 18 cubic feet, the model estimates that amount of electricity it uses would increase by another roughly 5 million BTU, but freezers of that size are relatively uncommon.